Essential and non-essential amino acid polymers connected via peptide bonds form a biological macro-molecule called “protein.” Proteins in the body perform several essential physiological functions, such as provision of energy, facilitating growth and muscle building. Essential and non-essential amino acid polymers connected via peptide bonds form a biological macro-molecule called “protein.” Proteins in the body perform several essential physiological functions, such as provision of energy, facilitating growth and muscle building, acting as a carrier of various other nutrients across cell membranes, helping in repair and replacements, or performing various other functions in the form of enzymes, hormones, and antibodies. Next to water, protein is said to be the most abundant element present in the human body. 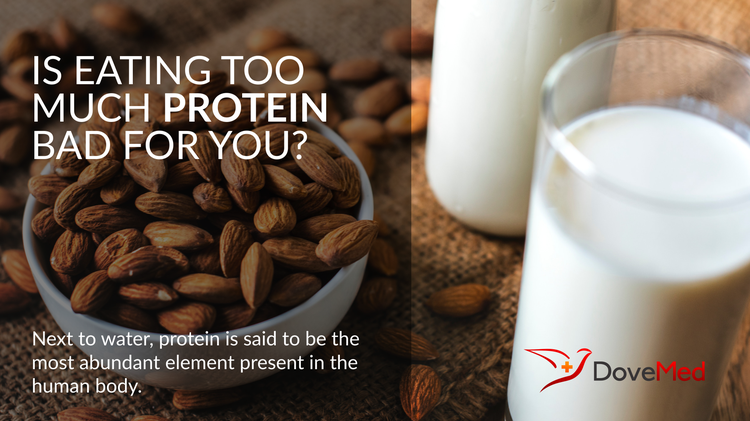 However, like every other nutrient, a recommended daily allowance suggests that there are certain amounts of proteins needed through the day for various age groups and health states. Low dietary protein intakes or bioavailability can cause deficiencies, while excesses may lead to several health complications. High protein intakes are generally alright for short durations, but prolonged excessive intakes can pose serious risks to health. The American Heart Association explains that large protein amounts from animal sources in the diet can lead to excessive fat consumption as well. This can lead to cardiovascular risks, weight gain, diabetes mellitus, osteoporosis, and kidney and liver disorders. Carbohydrate and fiber intake may also reduce as proteins tend to replace them on the plate when consumed in large quantities. This can again elevate the fat intake when practiced for a longer period of time. High plant-based proteins on the contrary may not elevate fat intake too much and such diet ideas are practiced as weight loss plans. However, even this may threaten to load the kidneys, when followed for a long time span. Another drawback of a high protein diet is the danger of dehydration. When in excess, proteins breakdown to form byproducts such as uric acid and blood urea in large quantities in the body. These are toxic and may cause gout, if not properly flushed out. In an attempt to eliminate these compounds, lots of water is pumped by the kidneys into the urinary tract and the toxins are eliminated during urination. Frequent urination thus, can increase thirst, hunger, as well as cause dehydration of the body, as the body’s natural response mechanism. With dehydration, several electrolytes may also be lost if the fluid is not replenished in a timely fashion. Minerals are being flushed out with water as well, which can lead to a significant loss of calcium. Thus, osteopenia and progressively osteoporosis are results of excess protein intake and dehydration. Severe cases can even present dental issues. In case of serious kidney disorders, careful protein calculations are required while planning for the patient’s diet. In case protein in the diet needs to be increased for any particular reason, such as weight loss or growth and development issues, such changes must be made in a gradual manner. Frank and co-authors reported in the year 2009 that individuals who doubled their protein intake had normal blood parameters for blood urea nitrogen (BUN) and urea on account of gradual physiologic adaptation. Weigman and co-researchers suggested way back in 1990 that “too much too fast” proteins can cause health risks and hence they concluded that the increase in protein intake must be a stepwise gradual process, to allow for the body to get accustomed to the change. Duncan, J. S., & Litchfield, D. W. (2008). Too much of a good thing: the role of protein kinase CK2 in tumorigenesis and prospects for therapeutic inhibition of CK2. Biochimica et Biophysica Acta (BBA)-Proteins and Proteomics, 1784(1), 33-47. McKeith, G. (2006). You are what you eat: The plan that will change your life. Penguin. Tapper-Gardzina, Y., Cotugna, N., & Vickery, C. E. (2002). Should you recommend a low-carb, high-protein diet?. The Nurse Practitioner, 27(4), 52-53.